Tastemonials: Is it Really Autumn? There are pumpkins on my walkway, so it must officially be fall. Only it’s 92 degrees outside! At least the Indian Summer heat doesn’t feel the same to me as a sweltering July 92 degrees. The days are shorter and the late afternoon sun is not so strong as it lingers closer to the horizon. Mornings and evenings have a crispness in the air that remind me it really isn’t summer, regardless of the number on the digital thermometer outside the kitchen window. In spite of the heat, my pumpkins by the front walk inspire me to cook for fall – I'm ready to eat pumpkin, one of my favorite flavors! There doesn’t seem to be a shortage of canned pumpkin like last year, but I’m stocking up just in case. I'll put it on the grocery list every week now. We had a turkey tenderloin left over from a couple of days ago, so last night I made pumpkin goulash from Bon Appetit magazine. You could look up the original recipe if you’re a purist, because I made a lot of changes. I dramatically cut down on the number of servings and I used different paprika based on what I had. 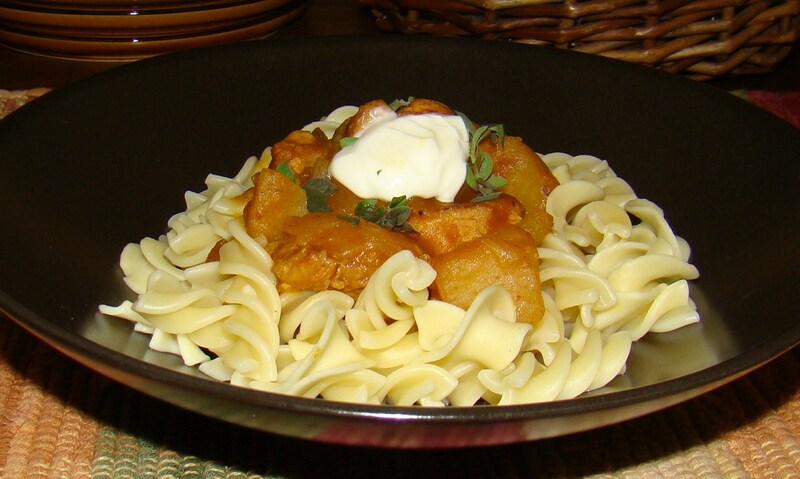 The original recipe called for a combination of Hungarian sweet and Hungarian hot paprika. I substituted Hungarian smoked and added some chili garlic paste for the heat. Chili garlic paste is my go-to ingredient when I want a dash of heat for any dish. I’m sure I got a different flavor from the original intention, but it was delicious. I also left out the caraway seeds, because Larry HATES caraway seeds and I did want him to eat dinner. The recipe is definitely a keeper and I think next time, I’ll add carrots and substitute sage for the thyme for another variation. 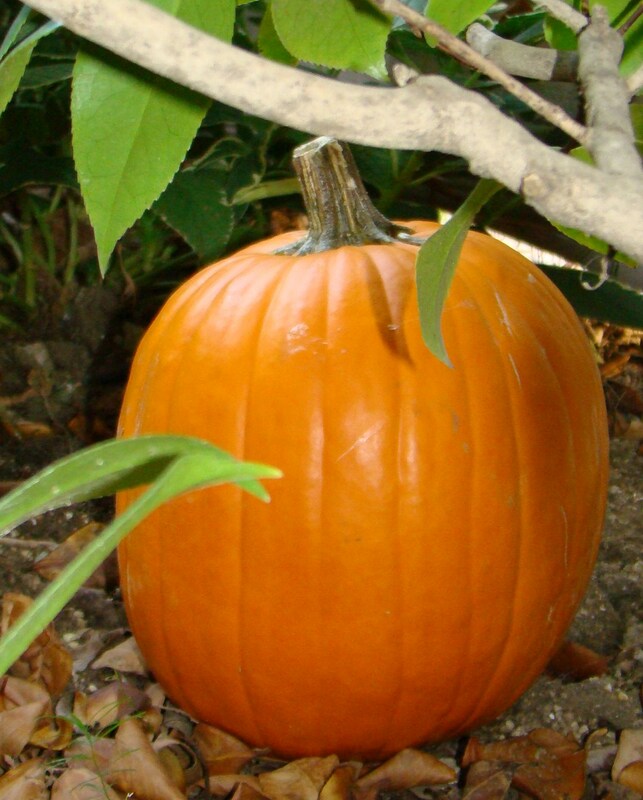 Or some Indian spices – that would go well with pumpkin also. Place turkey, paprika, chili garlic paste, salt and pepper in resealable plastic bag. Seal and shake bag to coat turkey. Heat oil in large pot over medium high heat. Add turkey to pot and cook 5 minutes, reserving spice mixture left in bag. 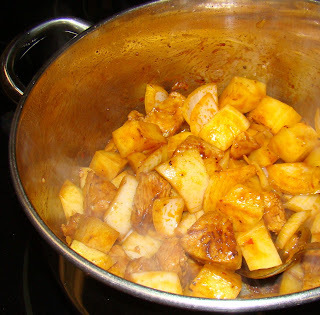 Place onions and potatoes in bag with spice mixture. Seal and shake to coat. Add vegetables to pot with turkey and cook 5 more minutes, turning occasionally. Add broth, pumpkin, garlic, bay leaf, and thyme sprig. Bring to a boil. Reduce heat and simmer, covered, about one hour until potatoes begin to fall apart. When cooked, discard bay leaf and thyme sprig. Cook noodles per package directions. Divide noodles among bowl and top with stew. Sprinkle with fresh thyme and serve with a dollop of sour cream. Stay tuned for how we used the other half of the can of pumpkin. I could never let pumpkin go to waste! Yum...that goulash sounds SO GOOD! Oh, and hey Larry- I HATE caraway seeds, too! So glad I'm not the only one...YUCK! !